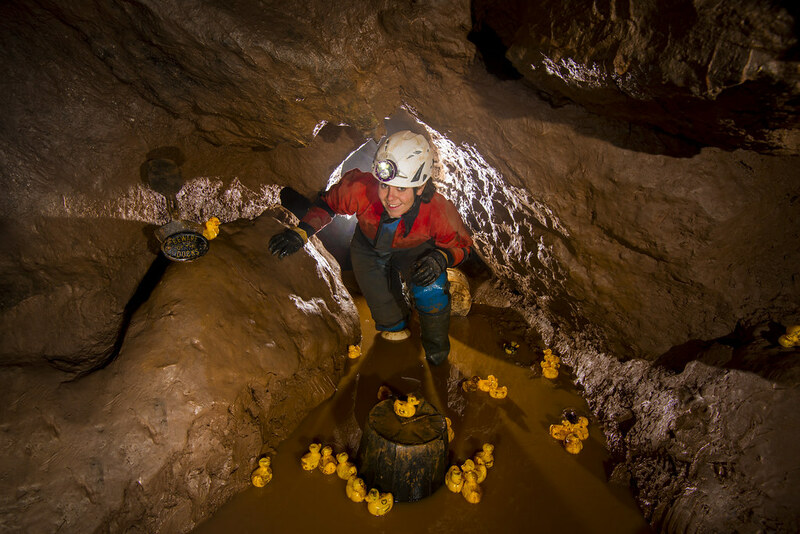 Having been inspired by Chris Binding's epic documentary charting the bottoming of one of Britain's most extreme caving undertakings... Goatchurch Cavern, a team of 6 were selected from Dudley's elite to take on not only this monster of a system, but to try and do the impossible triple of Burrington Coombe. Things almost immediately took a turn for the worse when a last minute change of base camp sent us to Banwell where our provisions were unfortunately not quite what we hoped. This would cost some of our team dearly later in the expedition as energy reserves began to exhaust. Regardless we were in good spirits as we made the walk up to the Goatchurch System. For anyone who has been to see the uninviting entrance you will know that just getting to this point is something of an achievement in itself. We followed a marked path through the forest crossing rivers and finally arrived at the breathtaking splendour of the vast abyss that is Goatchurch's main entrance. We were immediately impressed by the enormity of system and a disquiet descended on the group as we each took stock and walked away from the natural sunlight. 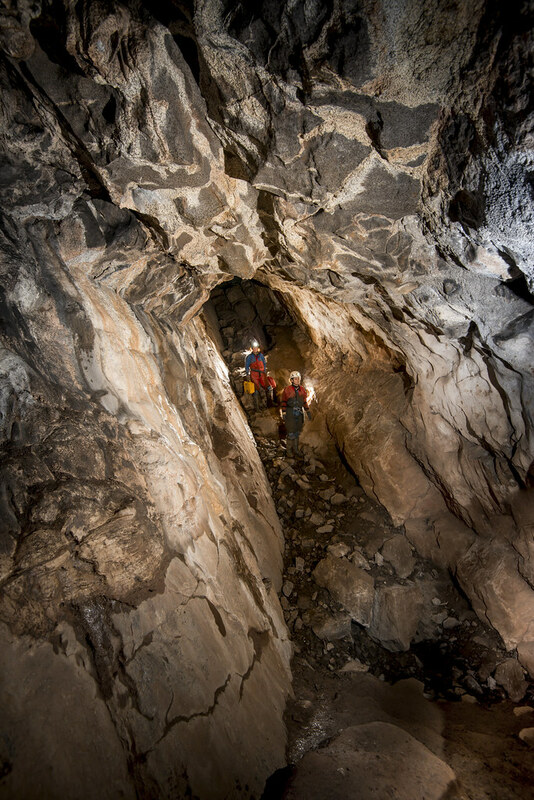 A team of scientists were doing a bat survey in the entrance chamber and we used their pre-rigged lines to descend deeper in to the heart of the cave. A few of us found ourselves in 'The Maze' and somehow managed, more by luck than judgement to find our way back out to Keith and Brendan's voices. A line was rigged for the Coal Shute. Many would use full SRT kits for this mammoth pitch, but with our years of training we each managed to free climb this obstacle with just the aid of a hand line. Everything had gone well up to this point. On a previous attempt a member had broken an ankle trying to do a controlled free fall across the top of 'The Coffin Lid' .....a glass smooth slab pitched at a 30 degree angle and known to allow an uncontrolled slide of up to 60mph if not performed correctly. With huge relief each member of the team performed our practiced braking manoeuvre to perfection and we lost none at this point. 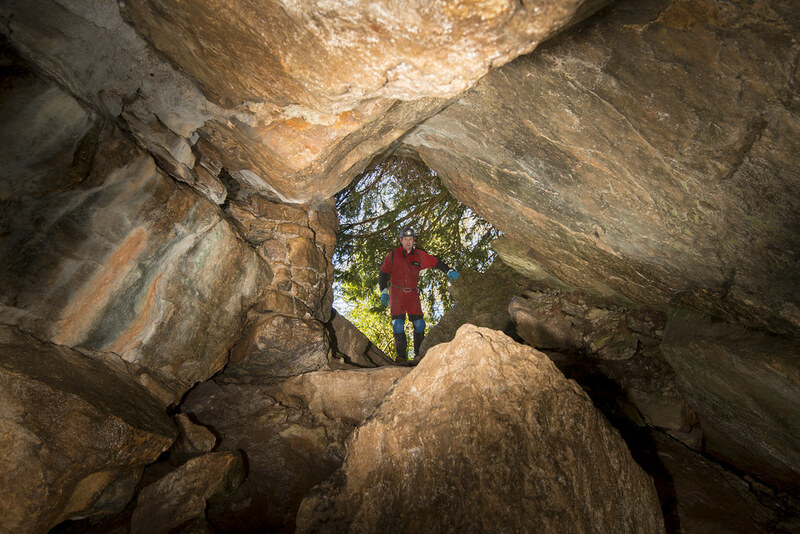 We had done our research and knew we would next be confronted by 'The Drainpipe'.......At almost 2km this tight and arduous crawl is notorious for ending many a cavers career and it was with a mixture of excitement and dread that we searched for the way in to it. Keith and Mel first found Hellish tight. Each of them tried to get through here, but both were doomed to failure. The guide books describe this as only possible by anorexic dwarfs. Keith in a valiant effort broke a rib trying to push this extreme caving squeeze and Mel was almost lost for good before being assisted out. We finally found our way in to 'The Drainpipe' and after over an hour of contortions and suit shredding body sized tube we emerged in to a huge chamber. 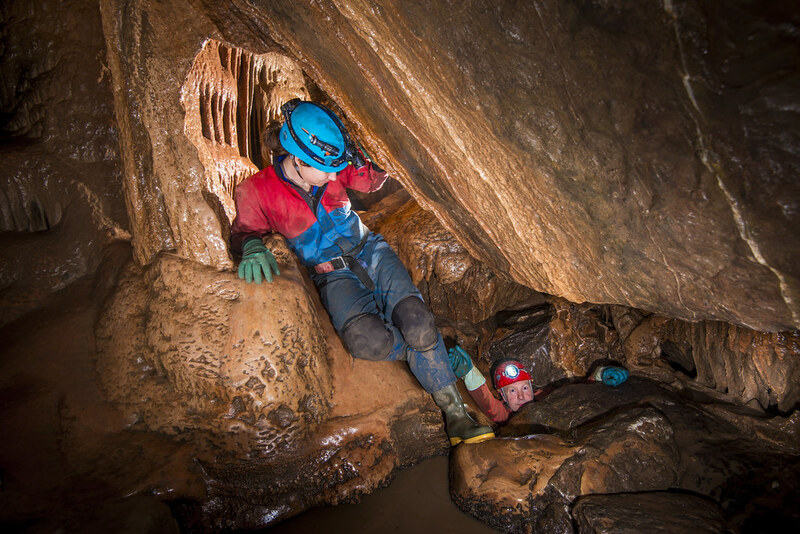 This is where lesser cavers would camp, resting before attempting either the gruelling exit or pushing the final limits of 'Dexion Extensions', but not us: we were on a mission. With a mixture of injuries and our energy levels dropping we fought our way back through the various obstacles in reverse. Each impossibly seeming harder and taking longer to negotiate than on the way in until finally when we thought all hope must be lost we glimpsed a shaft of daylight in front of us and spirits soared as we realised we had done it. We had faced Goatchurch and won! It was on this cloud-like high that we continued on to our next objective....Sidcot Swallet. Whilst Sidcot does not have the epic proportions of Goatchurch it is nevertheless regarded as one of the true adventures of the Mendips, with less people having visited the fearsome Ducks at the bottom of the system than have visited the surface of the moon and more perishing trying to succeed. We were all on the verge of exhaustion as we dropped through the entrance series to our first real challenge.....'The Tie Press' .....Chloe was leading at this point and faltered looking in to the darkness. She asked for a second opinion as it looked to be a contortion that just would not be possible for a normal human being. After checking our surveys and route descriptions we unfortunately found that this was indeed the feared way on. We were unsure that Keith would make it with a cracked rib. We all knew the stories of the ill-fated Harlem Cave Trotters who had the leader of their party break his back pushing to get through. Fortunately we are of smaller stature and larger egos and after many grunts and groans the entire team emerged with minimal bruising. As we walked from this I believe each of us shuddered knowing that we would have to return through. All was soon forgotten as we reached the head of 'The Lobster Pot' This is a deceiving obstacle and the original explorers are now known to have perished after dropping down this innocuous looking hole only to find out that is is near impossible to get back out. Fortunately we had brought a hand line to assist in this and with confidence each of us dropped through. Brendan stayed as top man ......like Armstrong and Aldrin before him Brendan had walked where only a handful had been before and knew we may need assistance from the top. We finally reached the stuff of nightmares, the feared Sidcot Ducks. We paused only for a quick photograph to prove we had made it before heading back. Keith with the agility of a gazelle actually managed to escape the climb unassisted. Mel, Chloe and Jess were next with just a little help from below. I positioned myself to climb just as a flood pulse washed over the head of the pitch from a stagnant puddle above, almost sweeping me away. At first I thought I heard laughter, but on reflection realise this was probably a nervous vocal fear release from the others fearing for my safety. I managed to get my head and arms out of the climb and could get no further. I tried this way and that using the last of my reserves and was about to fall back through to certain doom when my team each grabbed a handful of suit and hoisted me like an enormous turnip. For what seemed like an eternity we lay panting on the floor. Finally we realised that time was ticking away and if we didn't begin moving toward the entrance we maybe never would. I'm not sure of how we got back out, it is all a bit of a blur. I recall Brendan struggling at 'The Tie Press' and being called back as I overshot the entrance climb moving deeper in to unexplored cave. All I know is that my eyes welled with tears as I climbed out in to fresh air and walked down the mountain track. Life seemed somehow sweeter to me after almost losing it in the bowels of the Mendips. The triple of course can not be a triple without the last third of our adventure.... Aveline's Hole. Many walk past this gargantuan cavern never realising that aside from The Time Machine in Daren Cilau, this is the largest natural chamber in the British isles. Whilst easy walking passage the chamber continues for what seems forever before reaching a wall of steel bars and locks. It is said that this is the location of Britain's top secret gold reserves, but this could just be rumour as none have ever entered and returned to tell the tale.